The PM is in trouble with the language police again...and it is only Day 3 of his term as prime minister. Abe was mocked for bubbling away in the eager-to-please, peppy language of a schoolboy at his first press conference, including the incredible (almost Bushesque) stuffing of 31 iterations of the phrase "shikkari to " into only 23 minutes. Now he is getting the verbal switch across his posterior for his incredible katakana eigō explosion today during his first Policy Speech to the Diet. Prime Minister Abe Shinzō, in his policy speech to the Diet, made conspicuous use of English loan words as regards policy. In specifying "An ōpun economic society" for the "creation of inobēshon" and similar statements, it seemed that his goal in using the loan words was create an appealing sense of novelty rather in order to avoid having to spell out concrete numerical targets. However, when one compares to the contents of Beautiful Country, Japan, with its deeply conservative emphasis on tradition and history, one could not help feeling that the PM was a talking at cross-purposes with himself. Maybe the prime minister could get a little tutorial in "beautiful Japanese" from his Minister of Education, Culture, Sports, Science and Technology. The Gadfly on the Wall believes that the appointment of Yosano Kaoru and Machimura Nobutaka to the Tax Committee will result in a raising of the consumption tax. I do not think that Yosano Kaoru is in the pocket of the Ministry of Finance. In the final months of the Koizumi Administration, he was arrayed against the more happy-go-lucky stance of Financial Services Minister Takenaka Heizo, LDP Secretary General Takebe Tsutomu and the then Chairman of the Policy Research Council Nakagawa Hidenao. However, Yosano's stance was tactical, not strategic. With Tanigaki Sadakazu an effective check on Finance Ministry influence and Bank of Japan Governor Fukui Toshihiko sidelined by the Murakami investment scandal, the pro-fiscal budget balance team needed help. Yosano, who has a nose for going where he is wanted, found himself playing alongside the hard-money, balanced budget side. With Yosano on the tax hot seat, I think he will play a different game. He is not a fool--he knows that the consumption tax is regressive and will bite the elderly on fixed incomes hardest, followed by young couples just starting out. Yosano knows that trying to balance the difference between revenues and expenditures on the backs of retirees and the young families is a recipe for electoral meltdown. Even though he is neither one of the top party leaders nor a member of the Cabinet, with his head in a noose awaiting the outcome of the July 2007 elections, Yosano is still very sensitive about electoral failure. He is the oldest of the Koizumi children. He was in the political wilderness, sitting around, talking about politics but not practicing it much. Then Koizumi magic came along and gave Yosano the power him to reclaim his downtown district from the Democratic usurper Kaieda Banri. The government has given assurances of no consumption tax rises before next fall as a political bouquet to the electorate. I think with the rise in personal incomes from rising wages, land sales and stock sales--and continued rises in revenues from corporate tax receipts (unless, of course, the government decides to give away the store to the corporations), the debate over a rise in the consumption tax will be pushed out into 2008. [Interim translation] As regards the compulsory teaching of English in elementary schools--a point of contention in the new curriculum guidelines--Minister of Education, Science and Technology Ibuki Bunmei said on the 27th, "I don't believe it entirely necessary for it to be compulsory. If you cannot express yourself in beautiful Japanese, it is wrong to have done so in a foreign tongue." In saying this, he revealed his negative position. As one who attended elementary and middle schools where half the classes were taught in English using American textbooks--and half were taught in French using French government-approved textbooks--and thank Dieu for it, for otherwise I would have never learned world history, geography or mathematics [the American math texts asked so little of our minds we referred to "English math" as "math for idiots"]--I can assure you that being made to learn a second language from an early age has not got one goddamned thing to do with the facility (I can see now I am going to be sick of the association of utsukushii with Nihon by November) with which one expresses oneself in one's mother tongue. Oh, and by the way, if you are going to be railing against the use of loan words, perhaps you could sidle on over to the Kantei and tell the PM how goddamn ugly (and stupid) Takaichi Sanae's "inobēshon tantō daijin" title sounds. A week ago, I noted in passing a Sankei article about the resurgence of Japanese-made films in the domestic theatrical release market. It turns out that Bruce Wallace of the LA Times had dropped an article on exactly the same subject on his editor's desk 10 days earlier. The paper did not run the story until this past Sunday. Bad editor! Run Mr. Wallace's stories immediately in the future! In the same vein (and on the same day) the Tokyo Shimbun published an article on a subject Okumura Jun of GlobalTalk 21 and I (of Shisaku, I guess) have both been carping on for a while: the increasing prominence of legacy LDP leaders (including all the candidates for the LDP party presidency this time around) who were neither born in nor attended schools in the districts they represent. Take Abe Shinzō, for example. His local support group lauds him as the ninth prime minister from the former han of Chōshū, "the cradle of prime ministers". Except, of course, from nursery school to the day he left college, Abe was enrolled in Seikei Gakuen/Daigaku in Kichijōji. Abe took to calling himself a "man of Chōshū" only when he ran for his father's seat in the Diet. Of the 263 LDP district Representatives or LDP district candidates who lost in the district elections but "rose from the dead" thanks to the party lists for at-large seats, 59.3% attended high school in the district they represent or ran in and 40.3% did not (one stubborn old cuss would not reveal where he/she attended high school). Now for a society in motion like Japan was in the 1960s and 70s, with mass migration underway to the urban centers, a 60-40 split is not unreasonable. 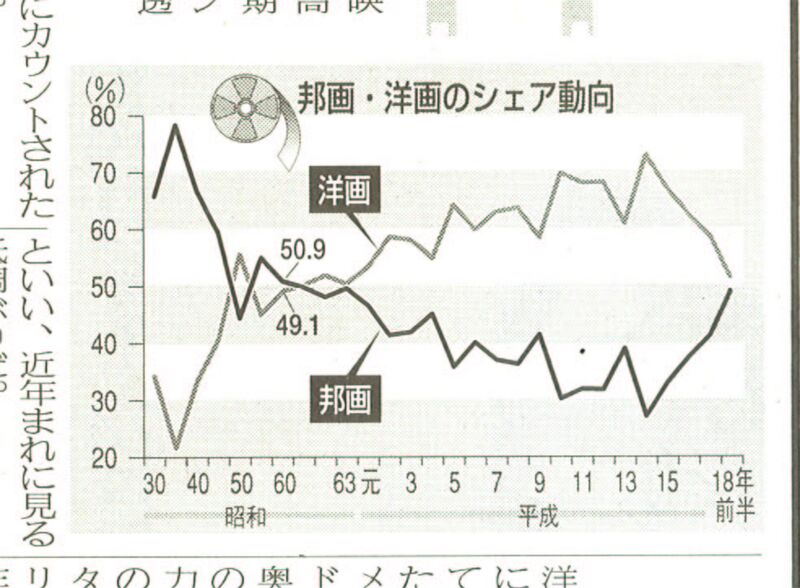 However, for a party that purports to be conservative and even traditionalist, having 40% of its members without furusato memories to call upon is a bit rich. All right, who spiked the punchbowl? Japan has a Special Advisor on Press Relations - the equivalent of a Press Secretary. How the heck is that going to work out with the responsibilities heretofore associated with the Chief Cabinet Secretary? Not one but two persons in charge of North Korean abductions. But on the bright side, Japan has an Arabic- and English-speaking Prime Minister's Special Advisor on Security Affairs with a degree from Cairo University and a background in television broadcasting. That she is an attractive woman with gobs of Cabinet experience under her belt is just icing on the cake. * Yamamoto Ichita – would get something for his pains. What a waste of a summer! Note on correction: This post originally said that Abe managed to get all the factions into the Cabinet. That was not correct--the Tanigaki faction got stiffed. Many articles and television segments have been waxing nostalgic about Koizumi Jun'ichirō, thanking him for all his hard work and all the fun times he has given us these past five years. I would like to take a moment to thank another member of the Cabinet--one whose fundamental cluelessness has been a constant source of wonder and comic material. I speak, of course, of the beloved and now-ex Minister of Finance, Tanigaki Sadakazu--a man who in four years of trying really hard, honest, never did get the hang of that "money and markets and budgets" thing. True to his nature, he could not leave the stage without uttering another stunning remark, indicating the Out-To-Lunch sign shall remain ever upon the door of his office. TOKYO, Sept 26 - Sadakazu Tanigaki, who resigned as Japan's finance minister along with other cabinet members ahead of the appointment of a new cabinet on Tuesday, called on the new administration to push fiscal reforms to gain credibility from markets in order to keep interest rates from rising sharply. Shinzo Abe, who was chosen as head of the ruling Liberal Democratic Party last week, is set to succeed Prime Minister Junichiro Koizumi after receiving confirmation in the post by parliament later on Tuesday. "Not that many people have talked about this, but one of key achievements by the Koizumi administration was showing the path of fiscal reforms for next 10 years or so, which kept interest rates low," Tanigaki told a news conference. "I want the Abe cabinet to gain credibility from markets on its stance on fiscal consolidation by having perspectives for medium to long-term (strategies), rather than worrying about short-term issues," he added. Wow, that is a most...interesting assessment of Koizumi fiscal policy. Uh...Tanigaki-san...there is a reason why "Not that many people have talked about" the Koizumi path of fiscal reform for the next 10 years or so which kept interest rates low. It has something to do with that other thing you had problems with..you know, the "reality" thing--and the significant differences dividing the real (what the voter demands), the unreal (what the politician promises) and the surreal (your take on the matter). ...and I say "Back, back, Spawn of the Unnatural!" Ah, gaming shows...what Amaterasu has wrought to make automobile shows and car races seem demure, unexploitative...and sane. 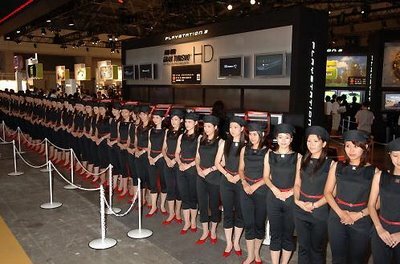 Tremble, tremble ye mere mortals before SONY Playstation 3's March of the Fembots! At the Capcom booth, the CEO, the CTO and the COO are waiting to respond to any questions you may have about the company's 2007 line of products. If you are a glutton for punishment, Mainichi Shimbun has uploaded 1001 of such images from Tokyo Game Show 2006. For those wishing to attend in person, sorry, show's over. Hmmm...so it is Ishihara Nobuteru for Deputy Secretary General of the LDP. Ishihara is unaligned. Giving him such a powerful and visible party post demonstrates a determined independence on Abe's part. Either that or he expects the Deputy Secretary General to be making a lot of television appearances over the next nine months. Scratch Ishihara from my list of Special Advisors to the Prime Minister. Nikai Toshihirō as kokutai iinchō is also an interesting choice. I had hoped that Abe would see the wisdom of appointing a noted China friend to the post of Foreign Minister. Nikai in the Foreign Ministry could have sweetened the sour and bitter in the relationship with Japan's big neighbor. Instead, Nikai will be working his mild magic on making sure the Kōmeitō is on board with the Abe program--a very, very tough job. So, is it an Aso vs. Shiozaki smackdown contest for the MOFA post? And who is going to be Minister for Agriculture, Forestry, Fisheries and Trade Pact Evisceration--a ministry post I missed the first time around? Well, one of out of three is not too bad. With Nakagawa Hidenao as kanjichō, no one will be losing his head to dentition. I guessed that a faction leader had to be in charge of the General Council. It turned out to be Niwa rather than Tsushima. Does Niwa's taking over the sōmukaichō post doom faction underling Shiozaki Yasuhisa's chances of getting a power post? I had picked Nakagawa Shōichi to be the point man for pre-election economic support policy through an appointment to the MLIT. Instead, Nakagawa is going to be in charge of the whole policy shebang. I did get right the need for a sitting Cabinet minister in the policy post, both in order to take responsibility for the current policy mix and to forestall embarrassing swings in policy stance. Nakagawa Shōichi is coming straight of the Ministry of Agriculture, Forestry and Fisheries. 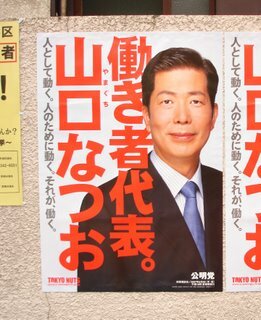 His appointment to the post of seichōkaichō is a riposte to Democratic Party leader Ozawa Ichiro's blunt wooing of the rural and economic loser vote. All these appointments--even and especially the election of Abe Shinzō as LDP president--are an attempt to forge a team capable of defending the LDP's backside in the July 2007 House of Councillors elections. Look for the possibility that the minor factions get spikes driven through their hearts tomorrow. I have been wondering for a while about the apparent discrepancy between the number of registered young foreign workers and the number of non-Japanese employees I encounter at the various businesses I patronize in the downtown area. According to this evening's Yomiuri Shimbun, the Ministry of Health, Labor and Welfare has begun asking a few questions too. It seems that someone has taken the Justice Department's figure of 2.01 million registered foreign residents, laid it alongside the Health, Labor and Welfare's figure of 340,000 foreign workers in Japan, and started to do some serious thinking about the relationship between those two numbers. I realize that in yesterday's listing of potential Cabinet and party post appointments, I left out some big fish. Shimomura Hakubun - has been a long time Abe collaborator. He was up front, next to, behind and damn near on top of Abe during the campaign this summer. He has to go somewhere--but where? If he becomes the Justice Minister--he has already been Parliamentary Secretary at Justice--where will Abe stuff both Wakabayashi Masatoshi or the other member from the House of Councillors to be named later? Yamamoto Ichita - another water carrier for Abe this summer, he deserves to be made Deputy Secretary General. I also referred in my previous irresponsible post to the Three Cheerleaders. In truth, it should be the Four Cheerleaders - I forgot Ōbuchi Yūko. Rumors about Ōbuchi being selected for a Cabinet post are not to be believed. How many times has she been elected to the Diet? Thrice. What? Not in a Japanese Court?!? For once, just this once, a Japanese judge gets it sort of right. By CHISAKI WATANABE -TOKYO - Thursday, September 21, 2006; 11:05 AM - A court ruled Thursday that an order forcing Tokyo teachers to stand before Japan's flag and sing an anthem to the emperor violated the constitution, a rare victory for the country's waning pacifist movement, plaintiffs' lawyers said. The decision bolstered opponents of Japan's growing emphasis on patriotism. I say "sort of right" because Tokyo District Court Judge Namba Kōichi did not reaffirm an absolute right to freedom of thought and conscience. The plaintiffs' arguments were accepted because the court deemed their objections serious--that the flag and the anthem were used to promote militarism and worship of the imperial house in the pre-1945 era and thus cannot be seen even now in a neutral or unbiased light. I really do not like that "even now" (genzai de mo), as it contains the seed of a future "Well, we are like so over that now!" dismissal of the complaint. This struggle is not over, of course. Ishihara Shintarō has prove his masculinity on this one, so the Tokyo Metropolitan District will waste yet more tax resources on an appeal. As the article notes, this decision will drive those who have been seeking revisions of the constitution and Basic Education Law into hysterical raving madness. Denunciations of the "excesses" of "activist judges", anyone? If you have not done so already, I would recommend reading Okumura Jun's recent blog post on the ideological diffferences still lingering in minds of surviving Japanese Imperial Army officers resulting from the differences in their schooling. Hal Varian of UCB, writing in The New York Times, has put together a well-written but disastrously hyperlinked reexamination of the increase in income disparities in the U.S. during the Clinton years. According to research being led economist James K. Galbraith at the University of Texas Inequality Project the tech boom led to concentrations of wealth in an incredibly small geographic area, leaving much of the country unchanged throughout the decade. U.S. national figures show increasing income disparity over the course of the Clinton presidency. The increase in the Clinton era, however, was not due to the rich of American grabbing and keeping more of the nation's wealth for themselves. If one makes a single small adjustment to the data - replacing the economic growth experienced in 4 of America's 3,100 counties - Santa Clara, San Mateo and San Francisco Counties of California and King County, Washington - with the national rate of economic expansion, then the radical growth in income disparity in the years 1992 to 2000 simply fades away. Slide 61 shows the result of the thought experiment--though the presentation is worth going through for the interesting things it has to say about the structural differences in the growth of inequality in Russia and China. 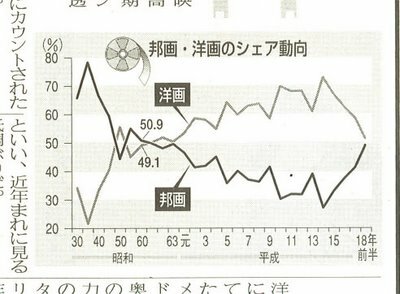 So now how many people (please raise your hands) believe that one could find 4 municipalities of Japan which would have an equally powerful effect on national statistics--that is, if we replaced their growth since 1992 with the national average, one would see the shakai kakusa disappear? What are those four municipalities? P.S. The Inequality Project has a nice list of papers on rises in inequality around the world. My, my...doesn't the LDP's home page look spiffy today. Still, it is nice of the party to have the totals for all the candidates, along with their bios and the lists of their supporters. Because the current mix of monetary and fiscal policy is largely his creation. He should have to defend it in next year's elections. Also, if he is not named either kanjichō or kambōchōkan, he will bite off someone's head. Because being the head of the second largest faction has to mean something, d-d-d-dang nabbit. He would also get to repeat his pet phrase--"Mine is the largest faction in the House of Councillors"--a lot, to great effect. Because he needs some better reading material. It also will give Nakagawa the opportunity to beat him up every so often. The Cabinet - see if you can forgive, me...please. Because Abe cannot have Mori faction members as both kanjichō and the kambōchōkan. Having Yosano as Chief Cabinet Secretary will also cut down on the number of people coddling the bureaucracy-- the government offices and residences are all in Yosano's electoral district anyway. Because I would not want him in this post (just thinking about the masochistic policies he will promote gives me a headache). He'll look great in the G8 group photos, though. A big surprise, if it happens - a lot of folks are betting on an Aso Tarō repeat here, especially after he picked up 136 votes in the presidential race. 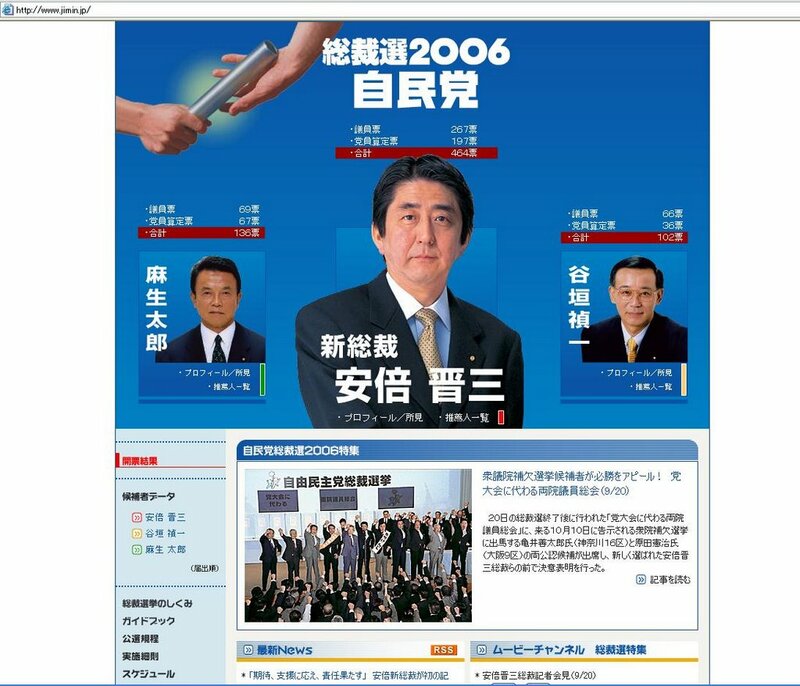 But seriously, can the same old face be used to sell the idea that Abe premiership represents a brand new start? Shiozaki Yasuhisa is still a little too too young get to a post this big at such a sensitive time. Choosing Shiozaki might convince Koga Makoto to stop griping, however. Because what's good for Toyota Motors and the Nippon Keidanren is good for Japan. Because it has always been thus, Grasshopper. Perhaps this is where they will stick Wakabayashi Masatoshi. Because its what the Kōmeitō wants, Grasshopper. Always. Just to keep him off the streets, basically. Also, after a year of Kitagawa, the MLIT folks will be wanting someone a little more feisty. Because if Takaichi-san were trying any harder to get Abe's attention, she would be committing adultery. Abe has to put a woman in a highly visible and sensitive ministerial post, and among the Three Cheerleaders, Takaichi's has the most Diet experience. Because this post is all about appearances, not commitments. Because he would so love to be the first true Minister of Defense. The last two Special Advisor posts are radioactive--both in terms of the subject matter and the people Abe heretofore has been seeking advice from. In reporting on euphoria, Hans Gremiel of the Associated Press suffers from something remarkably reminiscent of amnesia. Koizumi has been one of Japan's most popular and longest-serving prime ministers for good reason. Under his watch, unemployment has dropped, the stock market has rocketed, the government has been streamlined and bad debt has been mopped up at the nation's banks. The public corporations running the nation's highways have been privatized, and he passed a plan to do the same to the post office. Corporate profits have climbed and Japan's economy has now expanded for six straight quarters. Pulled out of a steep nose dive, maybe. Seriously, how has the stock market performed under Koizumi's premiership? 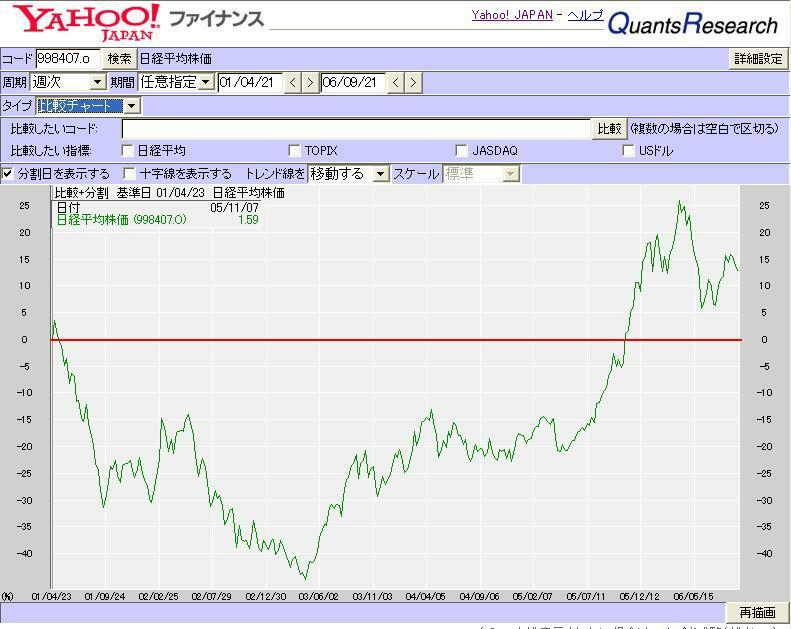 Let's look at a snapshot of Nikkei's performance from April 21, 2001, when Koizumi was elected LDP party president, until today. 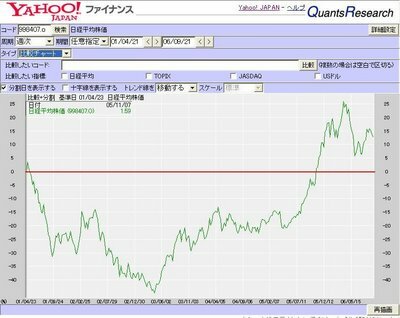 The graph comes courtesy of Yahoo Japan's Quants service. I have added a red line to show the zero line. Yowsa, up almost...13%...over 5 1/2 years. After being underwater for 4 1/2 of those 5 1/2 years. Yep, looks like we're in hagi, boys and girls. The Chinese official media's continuing silence on the relationship between Abe Shinzō and leaders of the Tsukurukai remains deafening. Not one peep about textbooks. China expressed hope yesterday that the newly-elected president of Japan's ruling party will "make sincere efforts" to improve Sino-Japanese relations. "We hope the new LDP leader can match his words with action and make sincere efforts for the improvement of bilateral relations," said Foreign Ministry spokesman Qin Gang. Abe who has repeatedly declared that he seeks better ties with China is set to succeed Junichiro Koizumi as Japan's prime minister next Tuesday, given the LDP's majority in the House of Representatives which has the final say in the choice. He has defended Koizumi's pilgrimages to the Yasukuni Shrine, where Japan's war dead, including World War II criminals are honoured; and refused to say whether he would visit the shrine as prime minister. "The key to solving the present difficulties is for the Japanese leader to make an early resolution on removing the political barrier of the shrine visits, and bringing bilateral relations back on to the normal track," Qin told a regular news briefing on Tuesday. Judging from Abe's political record and his words and actions while serving as chief cabinet secretary in the cabinet of the outgoing prime minister, it is hard to expect breakthroughs in the settlement of disputes between the two nations, said Zheng Donghui, a researcher on Japan at the China Institute of International Studies. The son of a foreign minister and grandson of a prime minister, Abe has positioned himself as a hawkish politician. Pacifists say Abe is a nationalist who will push for a militarized Japan, while supporters claim he just wants a stronger foreign policy. "Anyway, he can't avoid the problem of the Yakusuni Shrine, on which he has to make a wise political decision if he wants to improve Sino-Japanese relations," Zheng said. Mea Maxima Culpa - In a previous post, I said that Yagi Hidetsugu and Shimada Yōichi were the chairman and vice chairman of of the Tsukurukai. Yagi stepped down from the position of chairman to the position of vice-chairman in March of this year. In May, he resigned from position of vice chairman. Shimada Yōichi was a Senior Editor of the Tsukurukai's civics textbook. Missing from my list of close Abe confidants associated with the Tsukurukai is Kyoto University professor Nakanishi Terumasa. Nakanishi resigned from the Tsukurukai's Board of Directors on May 22, 2006. For the first time since 1985 (Showa 60), box office receipts of films made by Japanese studios and independents (dark line) are likely to surpass the receipts of imported films (light line). From an absolute nadir just 8 years ago (Heisei 10 - 1998), when local films captured only 27.1% of all receipts, the share of the box office captured by Japan's filmakers rose to a tantalizing 49% in the first six months of 2006. To what can we attribute this stunning rise in the popularity of local product over imports? OK heck, not even the Sankei even gave half a moment's though to #4. Can it. One of Abe Shinzō's most difficult tasks in this double election year will be to resist the demands of the 41 prefectures not named Tokyo, Saitama, Kanagawa, Chiba, Aichi or Fukuoka for greater public spending. A big loss in the April local elections will place excrutiating pressures on the Cabinet and the LDP leadership to promise to open up the public purse, especially as the ousted LDP rebels are playing sweet footsie with a suddenly pro-inaka Democratic Party. So how if the LDP chooses about a really, really radical response--one that proposes to shift private-sector economic activity into the smaller citites and less populated prefectures? How about proposing a law charging huge tax penalty for any of the 40 largest companies in Japan (in terms of revenues) having their headquarters in Tokyo, Kanagawa, Chiba or Saitama Prefectures--and furthermore setting a legal maximum of five Top 40 companies headquarters in any one todōfuken? Breaking the cycle of stupid - the truly big companies would finally be at a far remove from the ministries and each other, making collusion and intimidation more difficult. The greater remove will also make it much harder for society's leading lights to arrange meetings in bars or on golf courses--the two places where the really, really stupid ideas first come bubbling up out of the mental murk. 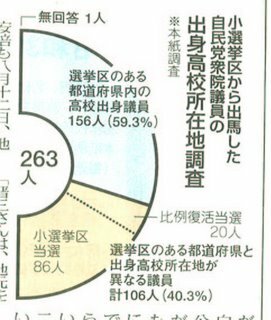 The tax penalty would only apply to the top 40 companies...but because a possible shift in the revenues ranking could put them in jeopardy, the companies in spots 40 through 60 would likely have move out the central prefectures as well, as a precaution. It would be like the end of the sankin kōtai. "[Abe]'s from the generation that doesn't know war," said Takashi Sasagawa, an LDP member of parliament's powerful lower house. "Not knowing war is his strength, because he can be on equal terms with other countries." Sasagawa has his base in Kiryu, Gunma Prefecture...and Amaterasu preserve me, I cannot pass up this one chance to post the "Absolutely Worst Japanese Pronunciation Pun Ever." An English-speaking foreigner asks his Japanese co-worker about his weekend plans. "So, do you have anything special planned for this weekend?" "Yes," replies the co-worker with great zest and a big smile, "I'm going to Kiryu." If the above makes no impression, try reading the joke out loud. Sign of the times - The local Jonathan's (Kamiyachō crossing) finally threw in the towel. A new sign on the front door announces that it will be open from 7:00 a.m. to midnight. So much for 24 hour service...and do not even ask me about the qualifications of the current cook on the morning shift. They've run out of impoverished Chinese students, I guess. So what's the new plan? Patrick Smith has a new article out from his series on Japan after 5 years of Koizumi -- this time on the new relationship between employees and work. By Patrick L. Smith - TOKYO You know there is something a little unusual about Yasuyuki Nambu, chief executive and president of the human resources company Pasona, when his assistant starts talking about the farm in the basement of headquarters in central Tokyo. For a minute there you thought she said "farm." For the flip side of the equation, the new management paradigm, see his article of three weeks ago "Made in corporate Japan: New approach to business". Michael Zielenziger writes in from wherever it is he has been hiding since he left Tokyo. His new book, Shutting out the Sun: How Japan created its own lost generation comes out tomorrow in the United States. It's about people who hide--and try to stay hidden. He's back - We are all hiding in some way. Some of us for a good reason. Wednesday, Sept. 13, 2006 - An aftereffect of the legislative battle over postal service privatization a year ago now vexes the Liberal Democratic Party leadership. It is how to treat Diet members who rebelled against the party by voting against the privatization bills. Of about 60 Lower and Upper house LDP members who cast "no" votes, nearly 40 were told to leave the party. Even though many of these rebels are no longer party members, some of them still possess political resources that the party leadership would like to tap in next year's Upper House election., the most infamous of the Diet's dearly departed quietly slipped back into his party's good graces. ...the reabsorption of the most notorious, most destructive agent of the past year back into the body politic from whence he sprang went by unnoticed. OK, it happened on the same day as Abe's announcement of his candidacy, so the story kind of got buried. Yes, Origami Man, the saviour of the final seven months of the Koizumi premiership, quietly and without any fuss, returned to the Democratic Party on September 1. Oh that Ozawa Ichirō--Mr. "Values for the 21st Century"--he'll take you as long as you're warm. Far be it from me to step down from the commanding heights to giggle at an inappropriate appropriation of the English language...but a political poster I passed on the street today must set a new standard for inadvertent self-parody. English-language slogans are almost always awkward, or at least forced. Kanebō's masterful "For Beautiful Human Life" is a personal favorite. It is heartening to see a Japanese corporation fully prepared for the presence on Earth, either currently or sometime in the near future, of sentient non-human lifeforms with money to spend. "Let Cupid Come on You!" Today, however, I believe I have seen a mistake that rivals the error in the wedding arranger's flyer, minus the salaciousness. Yamaguchi Natsuo is a Kōmeitō member of the House of Councillors. The poster is for a speech he is going to be delivering in front of the West Exit of Shinjuku Station on May 3, 2007. Well, there's nothing quite like getting the word out a little ahead of time. Sadly the words that I am likely to recall from this episode are not the ones he is going to say but those printed in one corner of his poster. There are those who say the Kōmeitō is a political front organization for a fanatical authoritarian religion. This is an utterly unfair and prejudiced depiction. The Kōmeitō is a political front organization for Japan's largest unregulated provider of microfinance. Anyway, among those who describe the Kōmeitō and its voters in less than flattering terms there are those who say that for the most part, Kōmeitō voters and candidates are...well, non compos mentes. Black and white waterbirds printed on Canadian $1 bills. Well, it seems, the Tokyo branch of the Kōmeitō, far from being coy about this, has coming right out with it. OK, could we have a tight shot of the bottom lefthand corner? Heckuva job, English-Language Slogan Committee. ...to reprint a Kyōdō news bulletin without a disclaimer. Yes, yes, Kyōdō (Everybody owns us; nobody controls us!) and its already tenuous relationship with the truth have gone through another rough patch. Japan is considering sending its ground troops to Lebanon to provide logistical support as U.N. peacekeepers, Kyodo News reported Thursday, citing government sources. The envisioned move comes after a cease-fire between Hezbollah and Israeli troops in southern Lebanon went into effect Aug. 14 following an earlier passage of a U.N. resolution that urges an end to hostilities between the two parties, it said. The report goes on to describe recent mass sightings of flying pigs, demonic ice skating competitions and ethical consumer lending company debt collection practices. Oh, hold your horses, Lily--somethin's wrong with the Kyōdō report, it seems. Japanese officials have denied reports saying that the country plans to send troops to Lebanon. The Kyodo News agency had previously reported that the Japanese government was studying a plan to provide logistical support for the UN Interim Force in Lebanon monitoring the cease-fire between Israel and Hizbullah, citing unnamed government officials. The Kyodo report said it remained uncertain whether Japan would approve the deployment given strong concerns over possible recurrence of fighting in southern Lebanon. The final decision is expected to be left to the new Japanese government, which will be launched later this month after Prime Minister Junichiro Koizumi steps down, Kyodo said. Government officials denied a Lebanon mission was in the works. "We are not considering a dispatch as reported," said Natsuko Sakata, a Foreign Ministry official in charge of Japan's peacekeeping operations. Guess we will just have to chalk it up to incompetence...again. But Abe's record is more nuanced than Koizumi's, and he appears to be purposely circumspect when nationalism and sensitive diplomacy intersect. While he is known for his tough views toward Asia, he earned this reputation by speaking out forcefully when North Korea admitted several years ago to abducting Japanese citizens. "He took a firm stance on an issue involving people's security," said Tsuneo Watanabe, a foreign policy expert at the Mitsui Global Strategic Studies Institute. "This is the essence of Abe's appeal. He actually doesn't say much about China, and I doubt he has hawkish views toward anybody, especially the Chinese." Abe also has two opportunities Koizumi did not enjoy, policy analysts say. He can guard his high reputation among conservatives and nationalists by striking the required poses while naming a foreign minister capable of talking to Beijing and Seoul at a productive level - a realist, in Sakakibara's terminology. Equally, Koizumi's Koizumi's brand of nationalism has been influenced by traditional sources of support that are in decline. His promise to visit Yasukuni appears partly to have reflected an effort to win the backing of the Association of Bereaved Families, a group representing those with enshrined relatives. This association is now losing its previous prominence, as even the children of the war dead are aging. Several weeks ago the association's head, a senior Liberal Democrat, spoke in favor of removing controversial war criminals from the shrine - an important signal that the association is aware of the damage the shrine has done Japan. Abe may thus be less beholden to elements representing an older, somewhat archaic kind of nationalism in the Japanese context. If so, a product of that tradition may prove more responsive to a newer and more vibrant stream in Japanese thinking. Now this is almost--but not quite--completely mistaken. Patrick Smith's analysis and reportage are solid. No problems there. It is is his sources--Katō Kōichi, Sakakibara Eisuke, Watanabe Tsuneo--who let him down. It is the data input problem: garbage in--garbage out. This trio have not understood Koizumi. They will not understand Abe. The fundamental analytical thrust remains correct, however; Koizumi's and Abe's nationalisms are different. Koizumi's nationalism is a nationalism of sentiment (whether or not such a nationalism is "archaic" or not depends on what one thinks archaic means, I suppose). It is grounded in the notion of noble sacrifice--of the longing to believe that the flower of Japan's youth did not die in vain. That Japan won or lost the war is secondary--what is insupportable is the repudiation of the valor of those who died fighting in protection of the nation--no matter the ideological reason for their sacrifice. When Koizumi goes to Yasukuni saying he prays for peace, he is not being glib. He feels he is honoring the millions of young Japanese who paid the ultimate price for the security of the nation. In Koizumi's world view, it is those who would negate the nobility of these sacrifices who are the enemies of peace. For them, each death was just a historical accident, a lemming's death, an instance of being swept over the edge by the force of a river of humanity suddenly set in motion. Koizumi wants the world to acknowledge the humanity of the individual Japanese soldier, sailor or rescue worker--and bristles when he is told that he cannot do so in the manner he sees proper. It was when the Chinese and South Korean governments tried to dictate to him what he could and could not do that they become his enemies. Abe and the new nationalists have a very different agenda. Normally, by extension, any product of these two working together would be the new nationalist's enemy as well. Unfortunately, the product of the constitution and the postwar education is what I believe is commonly called the nippon kokumin - i.e., the modern Japanese citizen. So, in addition to the Constitution and the education system, the new nationalists are enemies of the people. And it is the people's fault. The new nationalists take as a given, without ever having conducted a poll to confirm this point, that the populace shares their soul-searing mortification over the 1947 Constitution. They believe that the people cannot for even one more instant countenance that the founding document of the postwar Japanese state was written up, not by Japanese scholars and lawmakers, but by the idealists at SCAP. Again, the "people" who share this feeling of inadequacy are the same ones who have done very, very well--thank you very much---living under this constitution for 60 years--and who in some instances (let us say for a little over 50% of the total population) owe all their civil rights to the 1947 Constitution. The faith in this untested theory--that the people are red-faced with shame at the present Constitution--is the origin of the Abe campaign promise for a constitution made "by our own hands" (and not "by my own hands", as The New York Times would have us believe). I do not doubt, with the persuasive powers of the prime ministership, Abe will be able to generate support for this idea where none existed before. Still do the citizens truly despise themselves? As to the education reform, it is Abe's passion. A product of a private school education from the day he was weaned, he believes the students of public schools are prisoners of an out-dated, unpatriotic and anti-Japanese curriculum, frozen amber by Communist Party control of the teacher's union (Nikkyōsō) and underpowered school principals. Abe supports a complete revision of the Basic Education Law mandating patriotic thought and teaching. Of course, we all know what happened when the Kōmeitō's legal experts saw the last LDP draft revision of the Basic Education Law with the new patriotism provisions inside. They, uh, did not like it. The problems do not end with the domestic scene. Indeed, the real excitement with education reform legislation will come on the international stage. I foresee China and South Korea going ballistic (oh, please, let it not be literally!) when they realize that Abe's tight circle of advisors on education reform--the five gentlemen collectively known as "Abe's Brain"--include Yagi Hidetsugu and Shimada Yōichi--the chairman and vice chairman of the Atarashii rekishi kyokasho no Tsukurukai (a.k.a., the Tsukurukai). If he thinks he is going to slip that one past the Chinese and the Koreans--aiiieaaaa!!! ...before I took off a little time off to go chase after butterflies? Ah, yes...the plat du jour, the Koizumi-Abe transition. Freshman Bryan Walsh in the Time office gets off a good shot today--picking up on the issue that has put a hammerlock on the foreign policy apparatus of Japan: the decades of mockery and abuse suffered by the families of the abducted. It was hard enough for Shigeru Yokota to know that his only daughter Megumi had suddenly disappeared one day in 1977, almost certainly kidnapped off the street like a string of other Japanese by North Korean agents. But to turn for help to his country's officials--the very people responsible for the safety of Japanese citizens like Megumi--and be met with indifference, or worse: that was a special kind of pain. 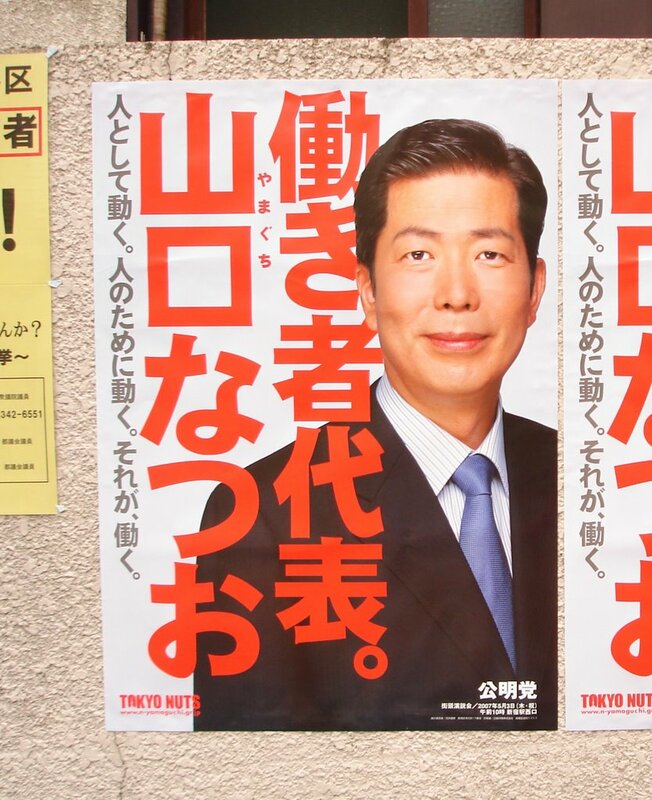 "At the beginning the government was not supportive at all," says the 73-year-old Yokota, sitting in the lobby of his apartment complex in rainy Kawasaki, a city west of Tokyo, posters of Megumi pinned to the walls. "People would just slap the petitions out of our hands." But when the Yokotas met Shinzo Abe, they knew they'd encountered a different kind of politician. It was a hell of a lucky guess by Abe--not only that this handful of families not only had suffered an identifiable injury at the hands of their own government, working almost in concert with the DPRK (unlike the Socialist Party, which actually did work in concert with the DPRK, leading to the murders of Arimoto Keiko, Ishioka Toru and their infant daughter)--but that Kim Jong-il's government would ultimately confess to the kidnappings. A hell of a bet--as risky as any taken on by the lucky Mr. K. himself. The whole matter could have gone nowhere, with the DPRK denying everything. To this day I do not know why Kim Jong-il admitted his wrongdoing--unless Tanaka Hitoshi had paid him cash up front. Anyway, Kim's admission transformed Abe into a crusader in the Koizumi mode--a tribune of the people, fighting the branches of the governing structure that had betrayed them. 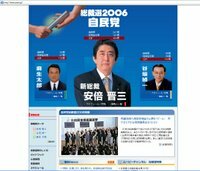 In Koizumi's case, the enemy of people was the LDP, the postal system and the construction state--the triumvirate that had sucked the life out of the Japanese economy while wreaking havoc on the nation's environment. In Abe's case, the traitors were in the mandarinate, particularly the Ministry of Foreign Affairs (to be really particular, the MOFA Bureau of Asian Affairs). They had not only not helped the Yokotas, the Hasuikes, the Arimotos...they had actively disparaged their claims. Which indicates that the incoming Abe may have a bit of a problem holding on to his steadfast reformist image--not that declaring a 5 year timetable for revising the constitution has done him any good. Koizumi ran a neverending campaign against the recalcitrant elements in his party while the Cabinet and the bureaucracy ran the country. Somebody kept the business of government going even as the LDP warred with itself. Koizumi had thus the freedom to play the reformer even as actual reforms were progressing through the Diet or through the commissions at a snail's pace. Abe, by contrast, cannnot make the bureaucracy into his nemesis. He must work hand in glove with the bureaucrats to keep the country going. He also has little leeway to fool around in the political playground - he will be starting out with a huge mandate from his own party. Not for change, mind you, as was the case with the first election of his predecessor, but for a slowdown or even reversal of recent changes. Furthermore, the DPJ under Ozawa Ichiro seems intent on pre-emptively adopting every single one of the worst anti-progressive ideas of the "forces of resistance" within the LDP. Abe is going to be hard-pressed to find a worthy domestic foil, an internal enemy against whom he can array his own policy agenda. Abe's brain trust will be of no help at all. His fellow travelers are gearing up for an assault upon their boogeymen--a defeatist, masochistic, individualism-worshipping education system and radical, unpatriotic, leftist academics. Yep those academics--killers every one. It is such a fine line between reading Gramsci and firing bullets out of the Asama Mountain chalet. Like their homologues in the United States and the Vatican, Japan's new nationalists are declaring war upon the 1960s--thirty years after the fact. Janis, Jerry, Jimi, Jim, John the XXIIIrd and Ienaga Saburo have shuffled off this mortal coil. When will these folks get over it? Many of them are scarcely older than I am--so what the hell do they remember of the Sixties anyway?